On 17 October 2017 a flight from the test airfield of the Irkutsk Aviation Plant to Zhukovsky Airport (owned by the Rostec Corporation) was performed by test aircraft MC-21-300 in order to continue the flight-testing program. The aircraft covered 4500 kilometres in a non-stop flight that lasted 6 hours. It was performed at an altitude of 10000 meters. A large number of the aircraft’s systems were manufactured and installed by the Rostec State Corporation. ‘The flight was performed in a routine mode. All the systems were operating smoothly’, reported commander Oleg Kononenko, who holds the honorary title of the Hero of Russia, on completing the flight. On November 2, 2017, the MC-21-300 test aircraft performed the first flight from the airfield of Flight Research Institute n.a. M.M. Gromov (Zhukovsky city, Moscow region). The flight lasted more than three hours. The characteristics of stability and controllability were assessed at the altitudes varying from 6,000 to 12,000 meters. All aircraft systems operated normally. 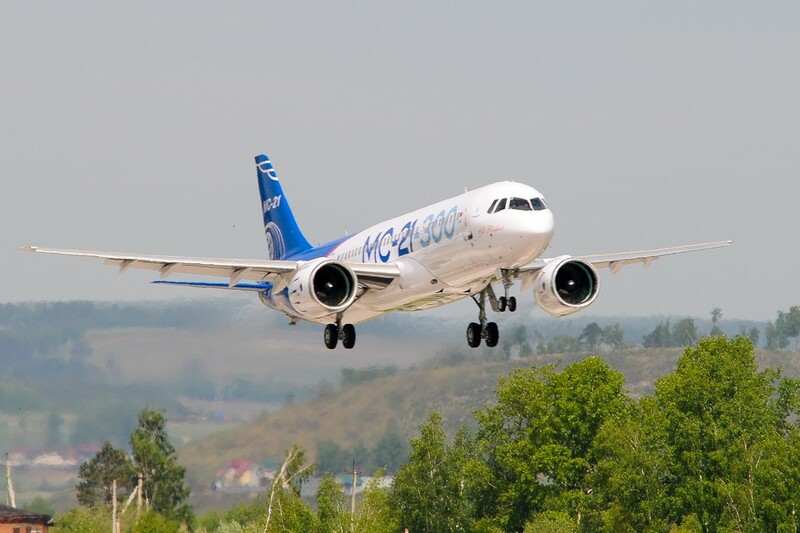 Flight tests of MC-21-300 aircraft are ongoing at the basis of Flight Test and Development Facility of Yakovlev Design Bureau, the affiliate of Irkut Corporation (the UAC member). Earlier, on October 17, 2017, the new Russian MC-21-300 airliner performed a non-stop flight from the “Irkutsk-2” airfield to the airfield of Flight Research Institute n.a. M.M. Gromov, upon completion of test flights at Irkutsk Aviation Plant, the affiliate of Irkut Corporation. Specifically for basing MC-21 aircraft, the new hangar with the up-to-date complex for collection, processing, and storage of information obtained during flight and ground tests, had been built in Flight Test and Development Facility of Yakovlev Design Bureau. МС-21-300 is a new generation passenger aircraft intended for the most massive segment of the air passenger market. The aircraft can carry between 163 and 211 passengers depending on the seating arrangements. ‘In terms of its flying and technical characteristics as well as efficiency, the MC-21 aircraft is superior to all its analogues. The aircraft's wing is made of specially developed polymer composite materials, which is the first solution of such kind used for narrow-body aircraft with a passenger capacity of over 130 people. The share of composites in the aircraft's design is over 30%, which is unique for this class of airliners. It is estimated that direct operating costs associated with using the MC-21 aircraft will be reduced by 12-15% compared to its analogues,’ said Anatoly Serdyukov, Industrial Director of Aviation Cluster of the Rostec Corporation. For the first time in the history of Russian aircraft-building the airliner is offered to customers with two types of engines: the PW1400G model made by US company Pratte & Whitney and the PD-14 made by the United Engine-Building Corporation (which is part of the Rostec State Corporation). The new generation engines use less fuel, they have lower noise levels and reduced harmful substances emission characteristics. The MS-21 aircraft meets advanced environmental protection requirements. To ensure maximum comfort for passengers, the MS-21 aircraft has been designed to have the largest body diameter among other narrow-body aircraft of this class. This solution ensures that passengers are not prevented from moving up and down the aisle if there is a food trolley in their way and allows airlines to reduce passenger turnaround time at airports. There is more natural light in the passenger cabin thanks to its large windows. Air pressure levels that are comfortable for passengers and an improved micro climate are maintained inside the aircraft. The initial portfolio of firm orders for 175 aircraft MC-21 ensures that production facilities will be operating at full capacity in the next few years. Advance payment has been received for firm orders. The main systems of MC-21 aircraft were manufactured and installed by Russian companies. As part of the implementation of the MC-21 program think tanks were created in Russia aimed at developing and making products from composite materials. To introduce new technologies, a wide-ranging upgrade of the production facilities of the Irkutsk Aviation Plant was carried out, a subsidiary of Irkut Corporation PJSC, and of a number of aircraft-building companies and related branches of industry. An innovative ergonomic cabin was developed for the pilots of MC-21 with the participation of the Rostec State Corporation. The high requirements for comfort levels and economic efficiency of the aircraft have necessitated the implementation of technical solutions in the field of aerodynamics, engine-building and aircraft systems. Rostec's enterprises also make composite aviation components for the tail unit. It is the technologies of making finbox components and stabiliser made of polymer composite materials that will give the airliner its competitive edge. They are distinguished by a high level of process automation. The weight of composite parts in the aircraft's design will be between 30 % and 40 %. In addition, the facilities of the State Corporation meet the MC-21 program requirements for titan by 100 %, they supply components (chassis), avionics and aviation electronics. In 2016 the Rostec State Corporation presented its aviation cluster strategy. Its key objective is increasing the revenue of the cluster's holdings and organisations at the average rate of 11.9% a year between 2015 and 2025. Moreover, the strategy envisages a 75 % increase in the market share of the cluster's enterprises in RF's aircraft-building (in such sectors as engine, helicopter and equipment building as well as avionics) and an increase of the market share in global aircraft-building in the relevant sectors by a factor of 1.5 up to 5 % by 2025. These levels will be achieved partly as a result of the development of after sales competencies. Military and transport aircraft service centres will be opened in the RF, in Asia, Latin America and Africa. Servicing the MC-21 will become a special area.